In June of this year, a CNN reporter named Fredricka Whitfield called the Dallas Police Department attacker 'courageous and brave' on the air. This comment caused quite an uproar as law enforcement supporters across the country demanded an apology. For many, this comment affirmed the belief that mainstream media is often slanted and presents a biased view of events; often catering to hard line political beliefs or attempting to gain support from radical groups opposed to law and order. Ms. Whitfield’s comment was not an isolated incident. For months, news-watchers of all media mainstream media outlets were fed stories with an unmistakable anti-police slant either ignoring facts, omitting them, or distorting them in favor of their “objective” media view . So called “experts” gave their anti-police views as well, as if the label were enough to convince the viewer of the validity of their anti-police views. Many Americans were/are fed-up. For one of them, David Chianese, a retired NYPD detective, the comments made by the CNN reporter were the last straw and he decided to do something about it. Detective (retired) Chianese founded Law Enforcement and Supporters for Media Accountability (LESMA); a non-profit group formed to hold the media accountable for their biased reporting, but to also help bridge the gap between civilians and Law Enforcement Officers (LEO). The group sees itself as a place for LEOs to be insulated from the public eye- where they can be themselves and be understood. It's a place for the supporters to interact with the LEO community openly and honestly. The first actions of the group were to write open letters to the media and city government officials, letting them know that the group was watching them and that the group planned to grow in number sufficiently to bring attention to those who unfairly target police, to include media, corporations, celebrities, and politicians. 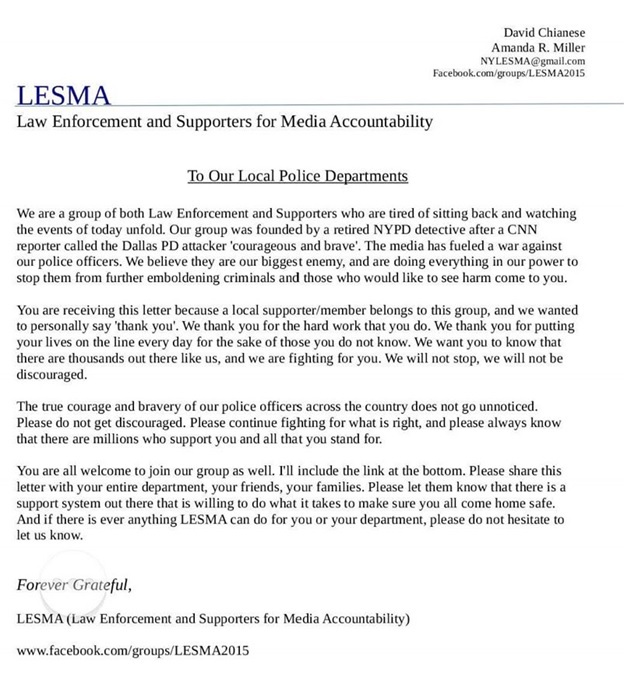 As a group, when they see a media outlet obviously slanting articles about the police, they ask members to go to their page and leave a comment using the #LESMA so that the group can be heard as one voice. 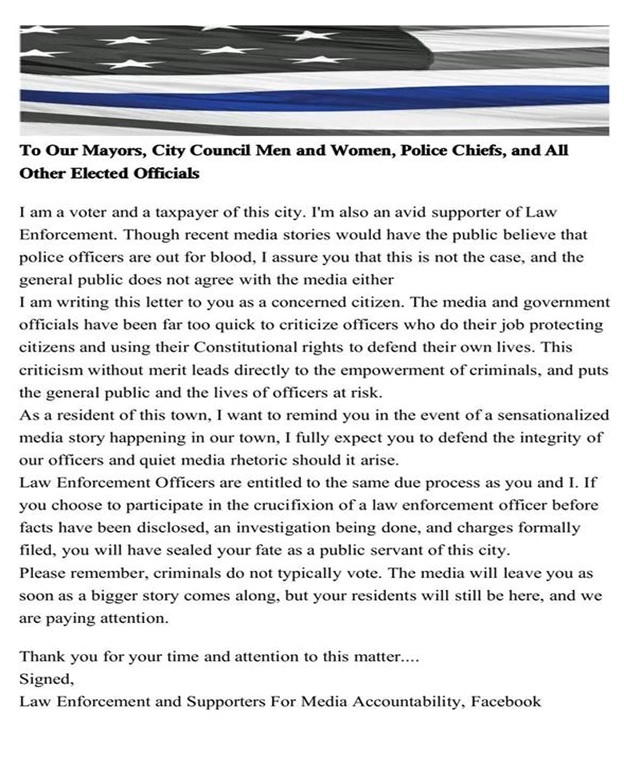 These open letters are shared with local media and city government officials. When LESMA isn't working on media stories, they are active in the community. They encourage members to go to their police stations and let the police officers know that they have support in their area. The group also sends open letters of support to police departments and has arranged with a children's hospital in NY to present them with a patch board full of first responder patches from around the country, as part of the Heroes for Heroes campaign. They also collect patches that members send in. On top of those community projects, the group also asks members to attend the funerals of fallen officers. They have networks in each state for members who have volunteered. The group’s members also respectfully attend the funerals of fallen officers. They have had volunteers at the funerals of Trooper Vincent in Louisiana, Trooper Bava and Sgt. Vassallo in Missouri and several others. LESMA also insulates heroes who have been thrown in the middle of media and public controversy for speaking the truth or doing their job. They have fundraisers and set up job interviews for the officers who have lost their jobs for doing these things. You can show your support for LESMA by visiting their website here.